Bandhan Bank Recruitment 2017- Vacancies for General Administrative, Retail Banking, Branch Head and other officer posts. 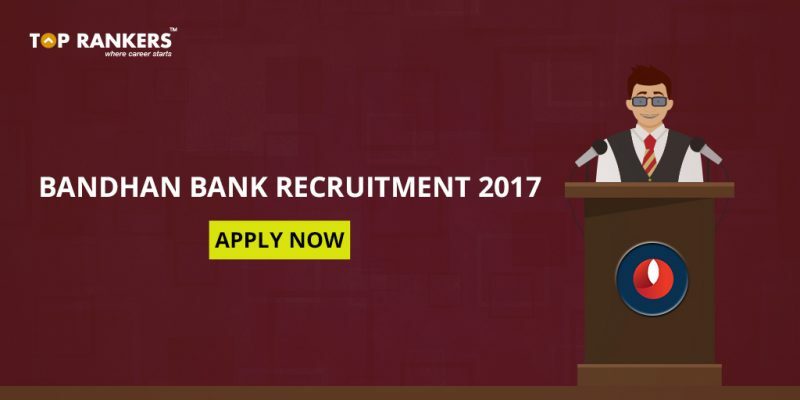 Bandhan Bank has released official notifications for recruitments across the country in the form of Bandhan Bank Recruitment 2017. The recruitment is for General Administrative, Branch Head, Retail Banking and other officer posts. Candidates who are interested and eligible can apply for Bandhan Bank Vacancies 2017. The students need to prepare well prior a few days of the exam from the Bandhan Bank exam pattern and syllabus. Are you looking forward to a career with Bandhan Bank? Then stop wondering and start preparing. You can download the Bandhan Bank Job 2017 Application form which is already available on the official website of Bandhan Bank i.e. bandhanbank.com or they can also drop their resumes at the email id- recruitment@bandhanbank.com. The selection process (final) will be based as per the academic profile and experience of the candidate. The aspirants who are shortlisted will be invited by human resources dept. of the bank for a personal interview round. The candidates who are selected will be appointed as per the vacancies and as per the calibre of the students. The candidates must have a Bachelor’s Degree or Post-Graduation Degree in any stream or its equivalent from a recognized university or an institution approved by the state government. The candidate must be of minimum 18 years as per the official orders issued. The Bandhan Bank 2017 application process will be both in online and offline mode. Candidates can select either of the ways to apply as per their convenience. Online Mode: To apply via online mode, you can drop your Bio-Data/Resume at the email id – recruitment@bandhanbank.com. Your Resume will be received by the human resources department of the bank. Offline Mode: You can send your applications via post/courier to the concerned official address of department. The interested and eligible candidates can fill in the Bandhan Bank Career 2017 Application Form which you can find at the official website. Please visit the official website of the bank i.e. bandhanbank.com. Visit the “Careers” section in the website. You can find an application form and fill in the required credentials. After filling in the form, click on the button which says submit. You can also send your resume directly to the Organization’s mail id or you can also send your resume via the postal address of the bank. Stay tuned for more updates on Bandhan Bank Recruitment 2017. All the best!